Real estate Analysts are financial analysts who deliver a detailed analytical insight to the buyers and sellers in support of acquisition, leasing, and marketing of properties. 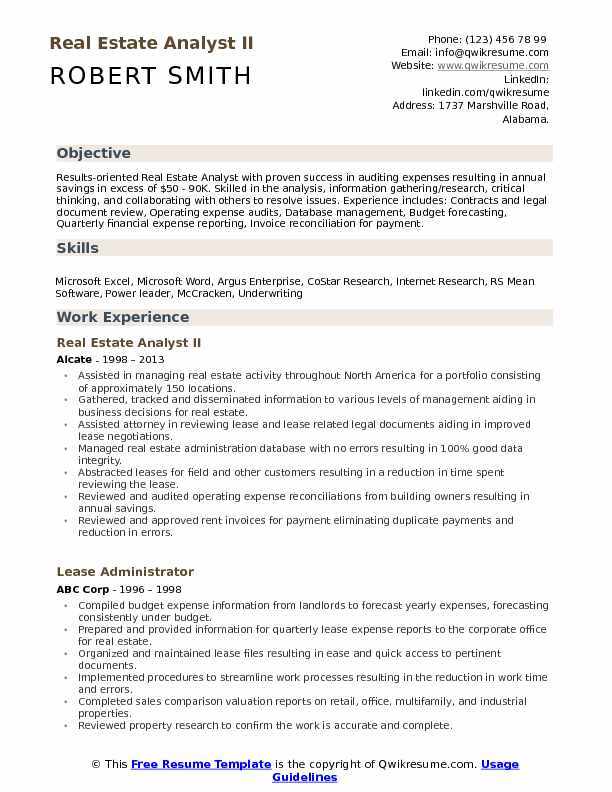 A Real Estate Analyst Resume highlights the following tasks – produces regular market performances for clients, maintains real estate rating models, monitors and analyzes the commercial and residential market conditions, manages the organization’s real estate holding, monitors and reports of key development in the property business, acquires market insights from internal and external sources and researches on new areas to invest in. 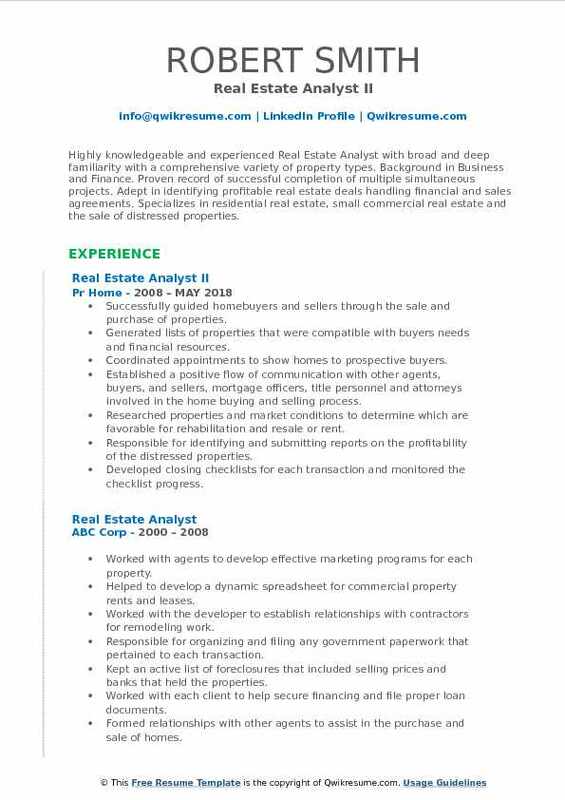 To be a good real Estate analyst, the candidate should have excellent skills in operating figures and have sound analytical and mathematical skills. Good verbal communication, fluency in writing and savvy with computers are also some important qualities needed for this profession. 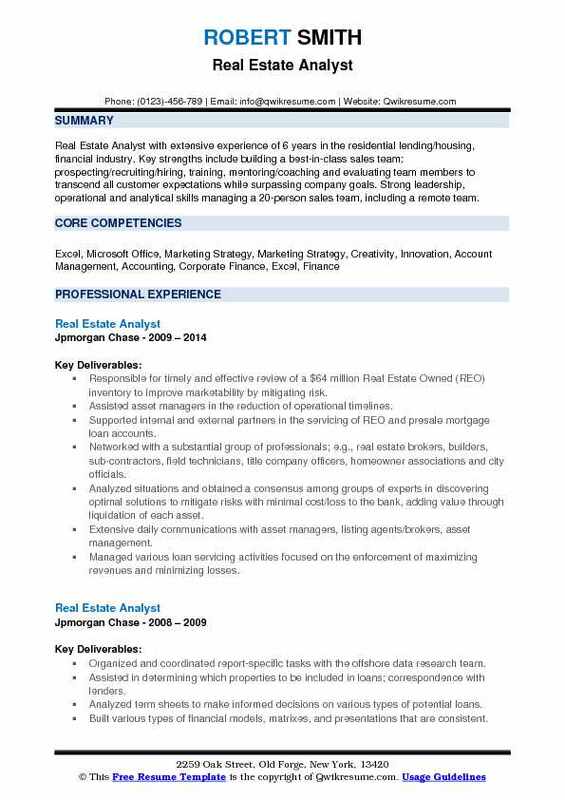 Most of the Real estate analyst resume depict a Bachelor’s degree in Business, Economics or Finance. Summary : Results-oriented Real Estate Analyst with proven success in auditing expenses resulting in annual savings in excess of $50 - 90K. Skilled in the analysis, information gathering/research, critical thinking, and collaborating with others to resolve issues. Experience includes: Contracts and legal document review, Operating expense audits, Database management, Budget forecasting, Quarterly financial expense reporting, Invoice reconciliation for payment. Assisted in managing real estate activity throughout North America for a portfolio consisting of approximately 150 locations. Gathered, tracked and disseminated information to various levels of management aiding in business decisions for real estate. Assisted attorney in reviewing lease and lease related legal documents aiding in improved lease negotiations. Managed real estate administration database with no errors resulting in 100% good data integrity. Abstracted leases for field and other customers resulting in a reduction in time spent reviewing the lease. Reviewed and audited operating expense reconciliations from building owners resulting in annual savings. Reviewed and approved rent invoices for payment eliminating duplicate payments and reduction in errors. Aggressively monitored critical lease dates resulting in savings avoidance of fees to the company. Assisted in preparing business case proposals summarizing the financial impact to the company to aid in business decisions with the least cost structure to the company. 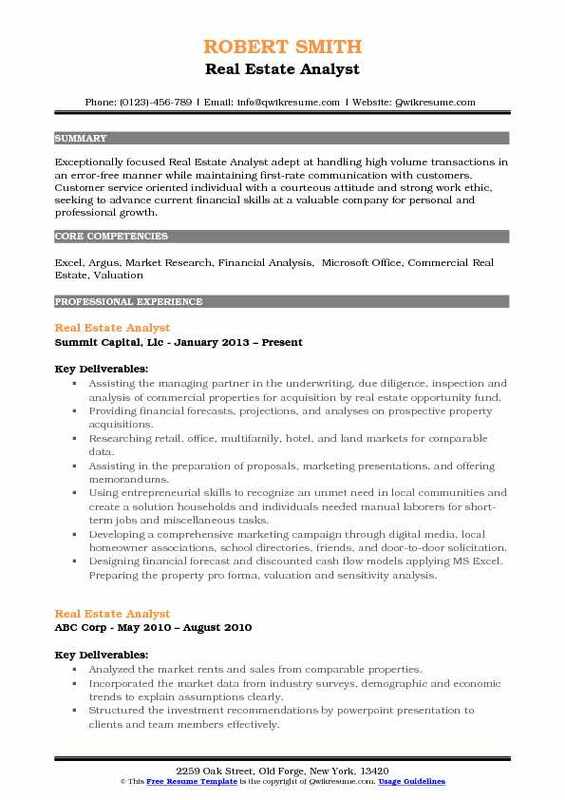 Headline : Real Estate Analyst with extensive experience of 6 years in the residential lending/housing, financial industry. Key strengths include building a best-in-class sales team: prospecting/recruiting/hiring, training, mentoring/coaching and evaluating team members to transcend all customer expectations while surpassing company goals. Strong leadership, operational and analytical skills managing a 20-person sales team, including a remote team. Responsible for timely and effective review of a $64 million Real Estate Owned (REO) inventory to improve marketability by mitigating risk. Assisted asset managers in the reduction of operational timelines. Supported internal and external partners in the servicing of REO and presale mortgage loan accounts. Networked with a substantial group of professionals; e.g., real estate brokers, builders, sub-contractors, field technicians, title company officers, homeowner associations and city officials. Analyzed situations and obtained a consensus among groups of experts in discovering optimal solutions to mitigate risks with minimal cost/loss to the bank, adding value through liquidation of each asset. Extensive daily communications with asset managers, listing agents/brokers, asset management. Managed various loan servicing activities focused on the enforcement of maximizing revenues and minimizing losses. Evaluated and resolved high priority problems through communication with customers. Appraisal review of broker price opinions and comparables for each REO asset and supplied weekly. 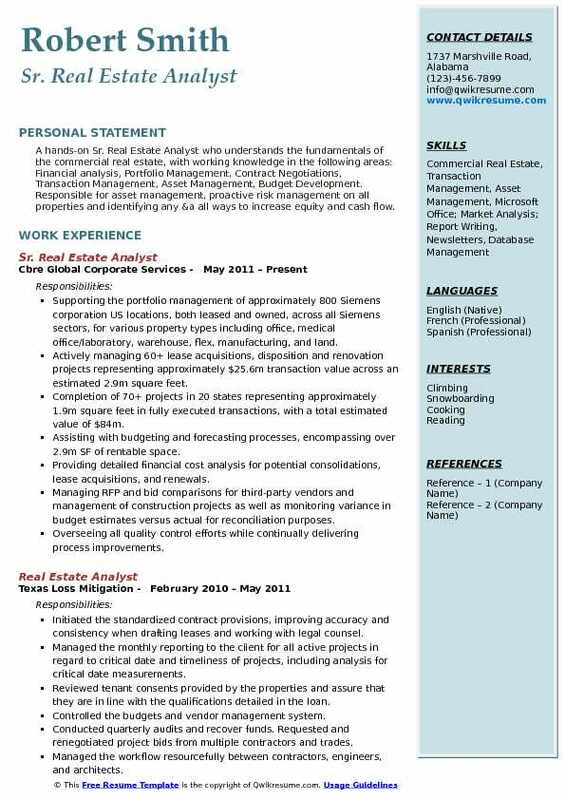 Summary : A highly motivated real estate professional with 10 years of experience in management, lease administration, analysis, and acquisition of real estate in both multi-family and industrial markets who is especially skilled at negotiating contract language and costs. 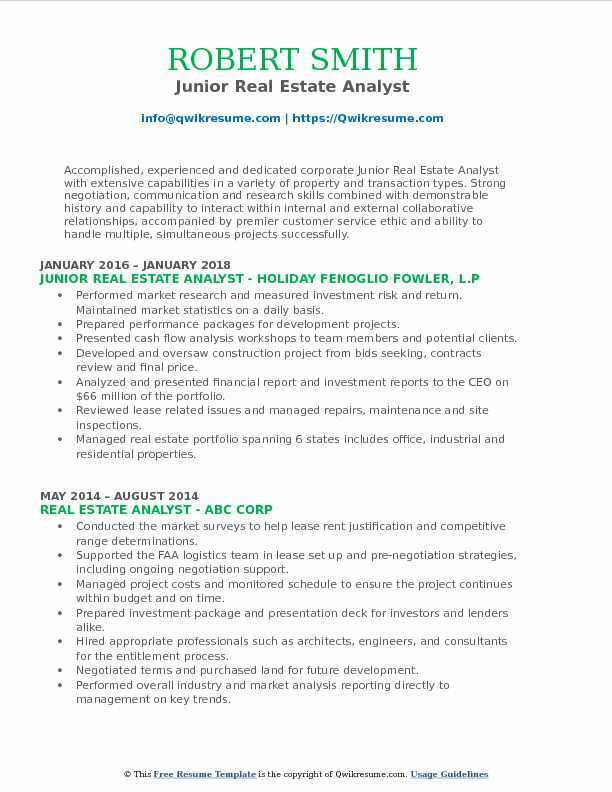 Seeking a challenging analyst position in the real estate field. Researching, reviewing, and acquiring new locations throughout the United States and managing those properties with a focus on controlling expenses and ensuring all properties property management needs are met. Gathering and reviewing the due diligence materials for locations under contract for purchase. Reduced waste removal costs by approximately 10% by increasing efficiency and negotiating a reduction in billing rates. Semi-nationalized snow removal services and reduced expenses by approximately $300,000 when using a comparable season. Responsible for maintaining records in connection with real estate transactions including leases, purchases, construction-in-progress, store openings/closings and property dispositions as well as processing rent payments, cam invoices, and property. Performed detailed and complex financial analysis and modeling to derive an overall value of commercial property. Perform market research and analysis for properties and markets considered for acquisition and development. Summary : Highly knowledgeable and experienced Real Estate Analyst with broad and deep familiarity with a comprehensive variety of property types. Background in Business and Finance. Proven record of successful completion of multiple simultaneous projects. Adept in identifying profitable real estate deals handling financial and sales agreements. Specializes in residential real estate, small commercial real estate and the sale of distressed properties. Successfully guided homebuyers and sellers through the sale and purchase of properties. Generated lists of properties that were compatible with buyers needs and financial resources. Coordinated appointments to show homes to prospective buyers. Established a positive flow of communication with other agents, buyers, and sellers, mortgage officers, title personnel and attorneys involved in the home buying and selling process. Researched properties and market conditions to determine which are favorable for rehabilitation and resale or rent. Responsible for identifying and submitting reports on the profitability of the distressed properties. Developed closing checklists for each transaction and monitored the checklist progress. Summary : A hands-on Sr. Real Estate Analyst who understands the fundamentals of the commercial real estate, with working knowledge in the following areas: Financial analysis, Portfolio Management, Contract Negotiations, Transaction Management, Asset Management, Budget Development. Responsible for asset management, proactive risk management on all properties and identifying any &a all ways to increase equity and cash flow. Supporting the portfolio management of approximately 800 Siemens corporation US locations, both leased and owned, across all Siemens sectors, for various property types including office, medical office/laboratory, warehouse, flex, manufacturing, and land. Actively managing 60+ lease acquisitions, disposition and renovation projects representing approximately $25.6m transaction value across an estimated 2.9m square feet. Completion of 70+ projects in 20 states representing approximately 1.9m square feet in fully executed transactions, with a total estimated value of $84m. Assisting with budgeting and forecasting processes, encompassing over 2.9m SF of rentable space. Providing detailed financial cost analysis for potential consolidations, lease acquisitions, and renewals. Managing RFP and bid comparisons for third-party vendors and management of construction projects as well as monitoring variance in budget estimates versus actual for reconciliation purposes. Overseeing all quality control efforts while continually delivering process improvements. 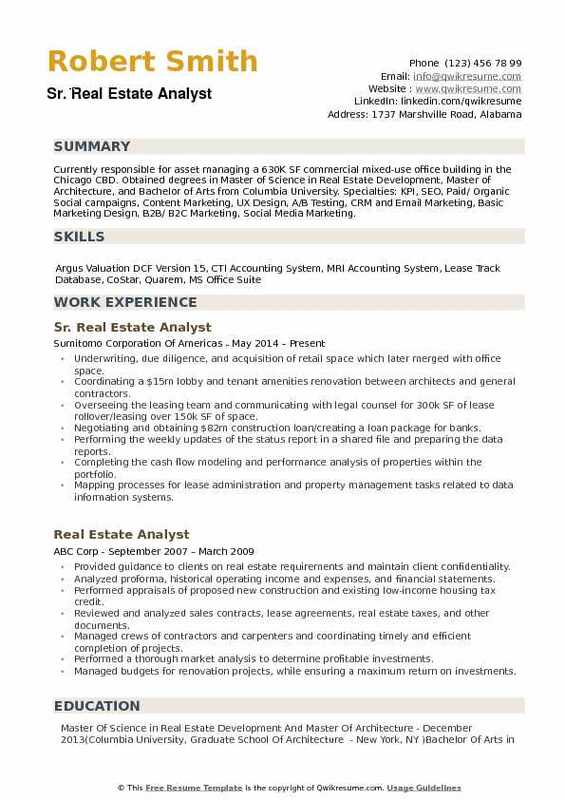 Headline : Multi-faceted Real Estate Analyst with strong analytical and software skills seeking opportunities in Real Estate Analytics or Workplace Strategy. A creative, and tenacious individual with a strong work ethic, who builds strong and lasting relationships with customers and teammates. Proven adaptability and ability to work under pressure in a fast paced environment. 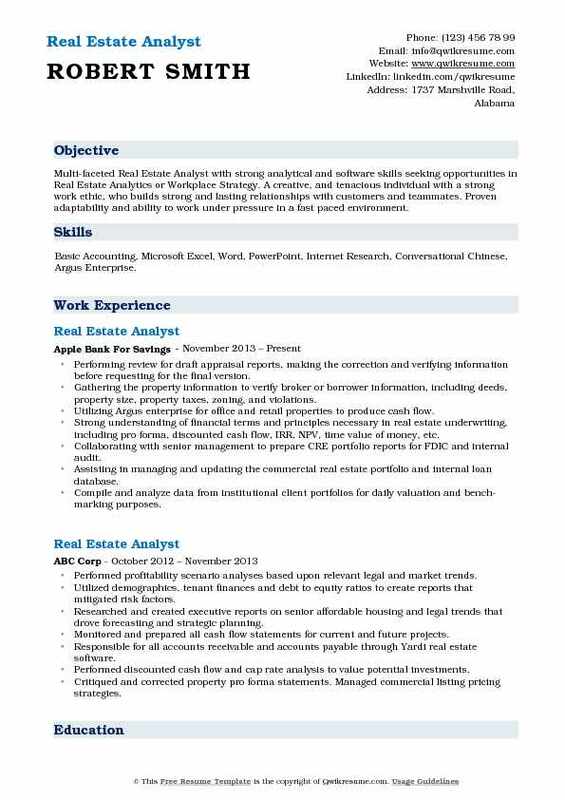 Skills : Basic Accounting, Microsoft Excel, Word, PowerPoint, Internet Research, Conversational Chinese, Argus Enterprise. Performing review for draft appraisal reports, making the correction and verifying information before requesting for the final version. Gathering the property information to verify broker or borrower information, including deeds, property size, property taxes, zoning, and violations. Utilizing Argus enterprise for office and retail properties to produce cash flow. Strong understanding of financial terms and principles necessary in real estate underwriting, including pro forma, discounted cash flow, IRR, NPV, time value of money, etc. Collaborating with senior management to prepare CRE portfolio reports for FDIC and internal audit. Assisting in managing and updating the commercial real estate portfolio and internal loan database. Compile and analyze data from institutional client portfolios for daily valuation and bench-marking purposes. 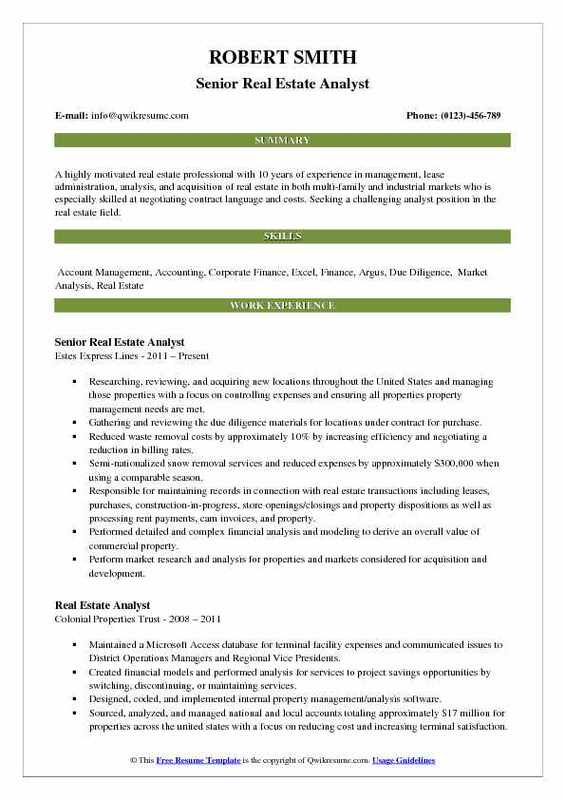 Objective : Accomplished, experienced and dedicated corporate Junior Real Estate Analyst with extensive capabilities in a variety of property and transaction types. Strong negotiation, communication and research skills combined with demonstrable history and capability to interact within internal and external collaborative relationships, accompanied by premier customer service ethic and ability to handle multiple, simultaneous projects successfully. Performed market research and measured investment risk and return. Maintained market statistics on a daily basis. Prepared performance packages for development projects. Presented cash flow analysis workshops to team members and potential clients. Developed and oversaw construction project from bids seeking, contracts review and final price. Analyzed and presented financial report and investment reports to the CEO on $66 million of the portfolio. Reviewed lease related issues and managed repairs, maintenance and site inspections. Managed real estate portfolio spanning 6 states includes office, industrial and residential properties. Searched property databases for apartments that met specific size and historical criteria laid out by the company as candidates to target for purchase. Managed vendor payment information, utility payment set-ups, and resolved issues. Created and managed lease drafts, licenses, permits, acquisitions and supplemental agreements. Headline : Exceptionally focused Real Estate Analyst adept at handling high volume transactions in an error-free manner while maintaining first-rate communication with customers. Customer service oriented individual with a courteous attitude and strong work ethic, seeking to advance current financial skills at a valuable company for personal and professional growth. Assisting the managing partner in the underwriting, due diligence, inspection and analysis of commercial properties for acquisition by real estate opportunity fund. Providing financial forecasts, projections, and analyses on prospective property acquisitions. Researching retail, office, multifamily, hotel, and land markets for comparable data. Assisting in the preparation of proposals, marketing presentations, and offering memorandums. Using entrepreneurial skills to recognize an unmet need in local communities and create a solution: households and individuals needed manual laborers for short-term jobs and miscellaneous tasks. Developing a comprehensive marketing campaign through digital media, local homeowner associations, school directories, friends, and door-to-door solicitation. Designing financial forecast and discounted cash flow models applying MS Excel. Preparing the property pro forma, valuation and sensitivity analysis. 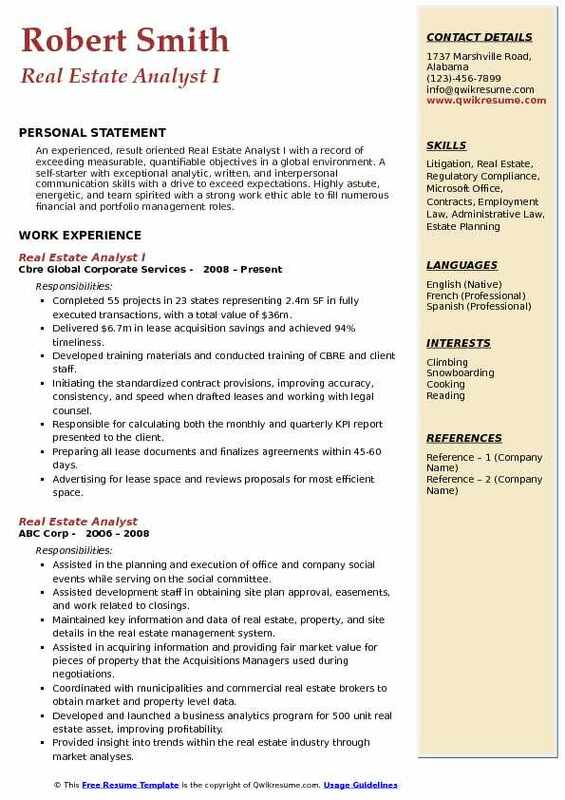 Summary : An experienced, result oriented Real Estate Analyst I with a record of exceeding measurable, quantifiable objectives in a global environment. A self-starter with exceptional analytic, written, and interpersonal communication skills with a drive to exceed expectations. Highly astute, energetic, and team spirited with a strong work ethic able to fill numerous financial and portfolio management roles. Completed 55 projects in 23 states representing 2.4m SF in fully executed transactions, with a total value of $36m. Delivered $6.7m in lease acquisition savings and achieved 94% timeliness. Developed training materials and conducted training of CBRE and client staff. Initiating the standardized contract provisions, improving accuracy, consistency, and speed when drafted leases and working with legal counsel. Responsible for calculating both the monthly and quarterly KPI report presented to the client. Preparing all lease documents and finalizes agreements within 45-60 days. Advertising for lease space and reviews proposals for most efficient space. Securing the appropriate lease space according to the agency's needs adhering to the defined leasing procedures. Summary : Currently responsible for asset managing a 630K SF commercial mixed-use office building in the Chicago CBD. Obtained degrees in Master of Science in Real Estate Development, Master of Architecture, and Bachelor of Arts from Columbia University. Specialties: KPI, SEO, Paid/ Organic Social campaigns, Content Marketing, UX Design, A/B Testing, CRM and Email Marketing, Basic Marketing Design, B2B/ B2C Marketing, Social Media Marketing. Underwriting, due diligence, and acquisition of retail space which later merged with office space. Coordinating a $15m lobby and tenant amenities renovation between architects and general contractors. Overseeing the leasing team and communicating with legal counsel for 300k SF of lease rollover/leasing over 150k SF of space. Negotiating and obtaining $82m construction loan/creating a loan package for banks. Performing the weekly updates of the status report in a shared file and preparing the data reports. Completing the cash flow modeling and performance analysis of properties within the portfolio. Mapping processes for lease administration and property management tasks related to data information systems. Analyzing the data from various systems and summarizing it into weekly and quarterly reports. Presenting the key findings to the management team and key stakeholders through visual reports. Consulting with various city, county and zoning authorities on location and zoning approval and entitlements.